« Easy Phone Wallet Organizer Video Tutorial Released! 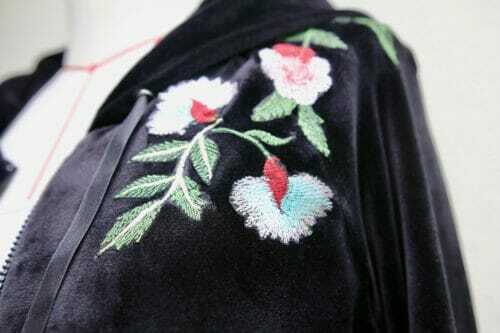 Floral Embroidered Velvet Hoodie Pattern- well almost…. This project started as an experiment. I wanted to make a floral embroidered velvet hoodie. Very happily I thought I had found the perfect fabric at my local fabric store. It was a beautiful embroidered knit and on sale too. What could be better? However, upon approaching the checkout counter, the lady tells me I owe $280 dollars for a yard and a half of fabric! I thought I had heard wrongly and extended my body around to see the number in the cash register –yep, I had heard right– that's the price. I inspected the fabric closely again and asked, is this silk or gold maybe?? Nope, 100% pure polyester. Had I known the price and fiber content of the fabric I would have never picked this roll of fabric, of course. The cashier and I got into an argument: “I cut the fabric so you should pay” and from me “there was no price and how can you charge so much for polyester? Plus I found it in a pile under a 30% off sign”. Eventually, I prevail and leave without the beautiful but insanely expensive knit. So I got to thinking, what if I just add the embroidery myself and save the $200 dollars? A little problem….my machine is useless when it comes to embroidery. I can do quite a lot with it if I am inclined to work hard and put the time in, but the best I can usually hope for from it is common sewing stitches. So I decided to use embroidered patches instead to achieve the look I was hoping for while keeping the costs down. A small pang of envy springs into my heart every time the embroidery subject is touched. If I could, I would purchase the Bernina 780 and place it in a shrine only to be touch when adding texture to any fabric by embroidering away. I have this maniacal image of myself embroidering away until the wee hours of the morning to end up with a majestic gown. My current Juki machine, however, is having a hard time even stitching a straight line these days, so I will be using a new technique to transfer the embroidery to the velvet. I'll write a separate tutorial about how to do this next week. This project uses stretchable velvet. Many would say that this is a scary fabric to work with, but I can assure you this is a myth, it is actually possible to succeed with stretchable velvet. The secret is a walking foot and a ton of patience. Go very slow. 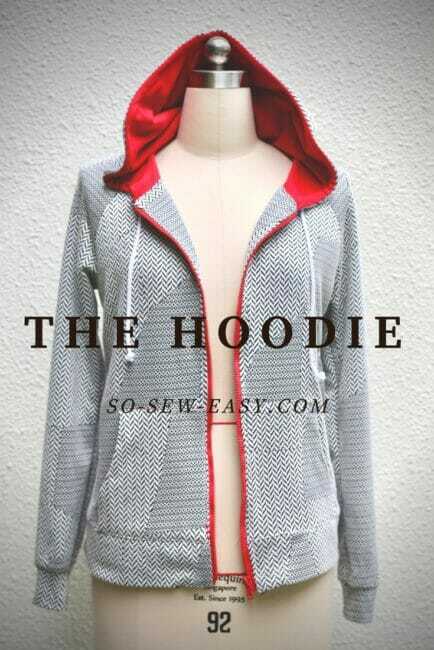 This is a completely new hoodie pattern and I've changed the design based on lots of reader feedback. There's now a bit more room in this hoodie pattern compared with the prior version. If you had the opportunity of making the first hoodie then this one is going to be even easier to make. The interfacing, lining, and pockets are all optional. I did use the interfacing and lined the hood using the velvet. I think it made it too thick although I like the look of the velvet draping on the back. I scratched the pockets completely due to my machine, but you shouldn't. It just became all too thick for it to navigate. I have placed the embroidered patches on the shoulders, to balance the design one side has more flowers than the other. And finally a small amount on one of the sleeves. 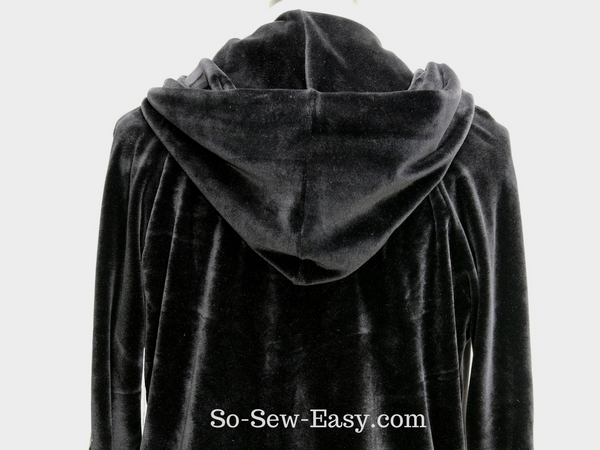 You can download the pattern for this Embroidered Velvet Hoodie from our account at Craftsy. We do not ask you to download any additional program other than Adobe Reader which is completely FREE. Use Adobe Reader to download and open the patterns, to print your pattern size, print on Actual Size and Landscape form. Do not scale the pattern. From S 40″, M 43″, L 46″, XL 49″, XXL 52″ to XXXL 55″ at the bust line. It is the same measurement for the hips. I have good news and bad news: The good news is that the instructions are exactly the same as the other Hoodie I have already shared with you. The size and shape of this new pattern are different and better, I think, based on feedback but the method and steps to make it are the same as the previous hoodie pattern which is linked below. The bad news is that I am experiencing sewing machine troubles. My industrial machine is unable to sew the stretchable velvet since it just chews it up. My industrial machine is a workhorse and prefers leather or canvas. My home sewing machine has lost its alignment and must be sent to be repaired. I have to say I will have to make a review of my machine model, but I will do it when I am not angry. I've already got a name for the article, however: “Junky Juki, Don't Buy This Machine!” but that would probably upset my local dealer. I'll have to reflect on that a bit before putting the proverbial pen to paper. In the meantime enjoy the new free pattern. Next week I will be showing you how to attach the embroidered pieces to the velvet. Until next time! As always, we really appreciate your thoughts and questions including photos in the comments section below. 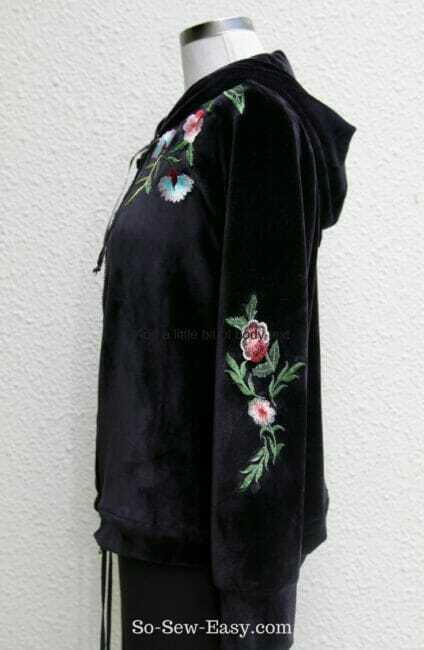 58 Responses to Floral Embroidered Velvet Hoodie Pattern- well almost…. Well, now I’m scared. My current machine is a vintage Singer 500, works pretty good but doesn’t like to do everything. I was given a commercial Juki, but haven’t tried it yet. Now I wonder if it was worth the price if you’re having that kind of problems with one. Will definitely have to try it and see. For those of you wanting to buy fabric online I can’t recommend fabric.com enough. Good prices. nice people, and you can look at a swatch big enough to tell if it’s even close to what you want. I think I’ve used them for over ten years now! Everything from smallest pieces to large amounts. LOVE, love, love this hoodies, and your fabric choices are sheer perfection. Thank you so much, as always, for your generosity in sharing all your goodies and expertise with us! I have a question, Mayra: what do you do in your FREE time???!!!! And yes, that was meant as a joke. Goodness gracious! Can you please post size information? The pattern shows sizes 6 through q4 but I do not see this translated into inches or centimeters. Thank you so much for this pattern! I’m a pretty new sewer and the directions were really easy to follow and the fit is great! Where did you get the beautiful appliqués? I haven’t been able to find anything that pretty online! Thanks again for all the work you put in to this, I’ll definetly be using your patterns from now on! Wow Alexa, that is a great hoodie. Thank you so much for the photo! Hi is Leah Oyeyemi. Please I just signed in for free pattern every Sunday, but after I got another message saying thanks for Subscribing . 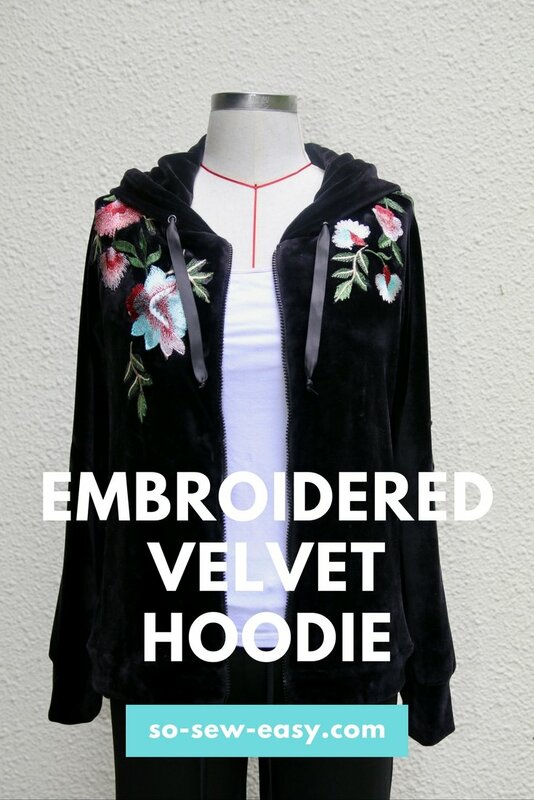 I have fallen in love and have to have a velvet hoodie. I want silk but have to figure some more to justify that since I’m on a fixed-income and little old ladies have no use for hoodies. Also silk is not worn much in my small town. They never got the memo that silk was washable I guess. I want navy silk lined in red and they can just talk. I would much rather wear silk, especially in the tropics where I live. If you can get your hands o it without costing a bundle of money, do let me know how it turns out. Where do you find such lovely embroidered florals? Hi Diane, I’m writing a special post later this week to show you how to do the embroidered florals. Please check back soon. Glad you like it! Stay tuned will let you know this week. The velvet hoodie is the epitome of class. I only wish I could figure out how to open in Adobe. I do have one quick question. Instead of using grommets, my sewing machine has a great round button hole. Can I use that instead of grommets? I just bought a new sewing/embroidery machine and REALLY want to make this. I already downloaded the pattern. How do I choose my size? I’m probably just missing the link, but it would be helpful if I knew where it was. 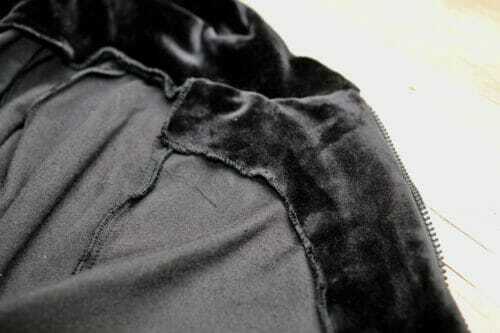 Also, where do I find good quality stretch velvet? Hi Sheryl, I’m not sure what country you’re in but I left some fabric recommendations in the post to get some good stretch velvet from Amazon.com. Are you able to see these? I have been looking for exactly this without paying $200! Where can I find the embroidery, please? Hi Carolyn, I’ll post a short tutorial about how I did the embroidery and where you can find it. Can you check back later this week? Thank you for the flower, lovely start to my week, I love flowers and I love Denmark (October visit 2007) such a great place to visit and get inspiration from furniture design to jewelry and fashion. I have only been once with my kids, my husband took them to Legoland while I went to the Georg Jensen factory to see how the jewelry is made. The glass roof boat tour is still printed in my mind. Thank you for reminding me I bought a faux leather with fur backing fabric to make a coat and I never did. I will look for it, make the pattern and share it with you. Let you know!!!!! I am so excited!!! I’ve done a lot of machine embroidery and currently own 5 embroidery machines, 2 ancient Brother machines and 3 Janomes, all are workhorses. If you want the most bang for the embroidery buck the Janome MC500e wins hands down. It has better features and is easier to use than machines that costs 3 or 4 times as much. The on board editing is fantastic, no need for extra software even though it comes with a good basic one. No affiliation, just a very happy owner. This looks darling. Have you tried satin inside the hood? My granddaughter had a velvet hoodie with a satin-lined hood and the ties were satin ribbon – very classy. This is a beautiful project. The embroidery is stunning. I will download this as soon as I get my computer to stop being a very cranky tool. I have one question however: What is a cam tool? Then if it has not been done recently I oil may machine following the directions from the manual. Completely re-thread both top and bobbin threads. Last step here: Cut a 4 inch square of stable cotton fabric and stitch it from corner to corner diagonally. Next pull the fabric diagonally and see where threads breaks. If the top thread breaks before the bobbin thread adjust top tension. If the bobbin thread breaks first adjust the tension for the bobbin. Hope this is helpful. The one in this article on grommets is an industrial one. They’re actually pretty inexpensive and there’s a link in the post to where you can get on Amazon, but there are also even cheaper handheld tools. For the price, I’d get the industrial one though. Thanks for the great pattern. I have Paff machines and have not had trouble with them. I love sewing and embroidering on them. I love this hoody and I just opened an email from Fabric.com that has velvet on sale! I will check it out for the stretchable. Do you think I could use lace inserts instead of embroidery? I have quite a few lace collars I inherited that could be cut and arraigned. I have a Juki HZL, please don’t tell me this is the model you are having problems with! Knock on wood, I have only had great experience with my machine! What is a Kam tool?? When I Googled it, all that came up was an industrial company. ?? I love, love, love the velvet jacket, it’s beautiful. I wonder if you can help me. I need to find a pattern for a men’s army style jacket that has 4 pockets on the front. ‘ve checked my fabric store in the books- Vogue,Butterick, etc. Haven’t been able to find anything. I have checked on other sites hoping to get a free pattern, but no luck. Thank you. Interesting comments on the Juki. I would look forward to your review of some sewing machines. I’ve been working with a basic mechanical Viking for the past couple of years and though I love it, I would like to purchase a computerized machine (sans embroidery function) that could do a better job with buttonholes. Most reviews I’ve seen are certainly complementary of Juki, Janome, Bernina, Viking, etc., but they are all reviewing brand new machines. If I’m going to spend $2,000 to $3,000 or even more on a machine, I’d like to know how it’s going to be doing 5 to 10 years later. Absolutely Teresa, the long term is what interests me. I want to have a machine that will last 20 years and not just 2. Let you know when I do write the review. Just my experience and opinions here, but, avoid any new Viking or Pfaff (post 2005) and Singer made in the last 25 yrs. As of just a few years ago all of these machines are made in China in the same factory. I’ve owned wonderful Pfaff machine from 1971 to 2000 and could sew anything on any of them. I even gave 2 as gifts to family members. After Pfaff and Viking are purchased by SVP neither have been long lasting or trouble free. I bought a Bernina 830LE in 2012 after so many other sewist/quilter friends raved about their machines. I’ve had it for 5 yrs. 3x maybe 4 I’ve had to take it in for service because thread got trapped in the bobbin race. The bobbin is an M size rotary (vertical) bobbin that swings out when you open the door. Cool…..not so much as you can’t access anything like threads or fuzz that gets in the race. As I said, it uses M size bobbins and only accepts the Bernina ones. You can’t use prewound M size bobbins, which I have oodles of since I am a longarm quilter, too. There is no manual presser foot lifter, not good for a granny sewer like me who likes to be in control of when I want the foot down. I does beautiful embroidery, tho. It does sew very nicely and has a lot of fancy stitches and about 10 or more different buttonholes. Like, who knew there were that many different kinds? So, now, I have a Babylock Unity, first time for that brand. Many of my friends have the brand and haven’t had problems so I’m hoping I’ll be lucky, too. I wish I could build my own machine with the features I really like and not all the bells and whistles that get you excited and then you find are either a pain to have or not helpful or used. I still think Berninas are very well made machines. So if you’re looking for a good basic plus a few nice, helpful features and don’t want embroidery I’d look at those, even used ones. If you find an older model Pfaff like a 2140/2170, 7570, 2022, or 1472 they are all workhorses. I still own 3 of those models as well as an older one, a 1229. I’d check with dealers in your area and tell them you’re looking for one. This is beautiful in velvet! Wouldn’t you want to apply the embroidery to the unsewn pieces first and then construct the hoodie?? Hi Michele, I’m doing a separate tutorial on the embroidery later this week. Please be sure to check back then. Glad you liked it and thanks for your comment. Mayra, thanks for bringing us such variety in your projects. I especially like your apparel projects as I am a clothes addict. Love the wallets, handbags etc but am always looking for clothing inspiration. I appreciate your hard work and hope that you and Debi can continue to inspire us all. For what it’s worth, I will share my embroidery machine experience. I wanted both an embroidery and heirloom sewing machine. My Kenmore was working just great; but, it was 40 years old and I wanted more!! I selected the model I did for several reasons. Having zero experience with embroidery machines and after learning the machine, all the reasons didn’t matter. They were either not as convenient as I imagined them to be or they were made obsolete by technology advancements. I found, for me, the far better answer to my desire to upgrade would have been two separate machines: a standalone embroidery machine and an heirloom quality sewing machine. I also discovered the HUGE hoop that was so attractive is not only difficult to use, but I rarely do designs that large. I also found that one should buy a machine that has at least a hoop 5″ x 7″. Hold out until the dealer offers the associated digitizing software for free. You will need it, but you don’t want to spend more for design software than for the machine, itself. Don’t buy a machine that the largest size is 4″ x 4″ as you will outgrow it in a year and that year will be filled with frustration. Embroidery machines are really quite wonderful, but they have a huge learning curve. Expect to spend a lot of money in thread, stabilizers, fabric, and designs and invest a lot of time and ending up putting everything (except the design) in the trash. Lastly, but important, buy from a dealer and take all the free classes on using your new baby they offer. You are NOT saving money by buying from a big box store or online. You will need the support offered by a dealer. OH DEAR! Bad sewing machine days are (hopefully0 not that frequent, but they can really make us want to scream! Thanks for your patience in writing the article. Which Juki model and who made it. Also look to the Janome embroidery machines. After a few problems with Bernina I purchased first the Janome 300e stand alone embroidery machine and recently upgraded to a used 350e Janome. This one is also well used with many hours on it and embroiders beautifully. Only problems I have are owner operator. Also what makes you think the other machine has an “alignment” problem. That is as rare as a timing problem. HI Gale, the needle is about 1/8″ to the left hitting the plate, it happens every time I use the walking foot. I do not have access to many good sewing machines here. If I want one I need to purchase in Hong Kong, (4 hours flight). Sydney (7 hours flight) or Kuala Lumpur (7 hours by car). Exchange rate, taxes and hotel and plane ticket it gets to be a very expensive sewing machine. I thought uou had a a Bernina in your studio? It would be a breeze! Thanks for the pattern! Sharing the free patterns with us is appreciated. What is of the greatest appreciation, to me, is the detailed assembly instructions (and sometimes accompanying videos). Your instructions allow me the pleasure of making without stress. Good for you for leavig that insanely priced fabric behind! Plus, for making something equally beautiful! You always encourage me to be brave in sewing AND in behaving reasonably! Wow, even with all of your machine problems, you sure did a beautiful job. I own a Pfaff Pro Embroidery machine and with my software, I will be able to embroider a wonderful design. Thank you for the inspiration as well as the free pattern. You can be really proud of your accomplishment, it is truly beautiful. Think about Babylock Sewing/Embroidery machine before you buy. I buy mine from BSewInn in Tulsa,Ok. I have 3 sewing,1sewing/Embroidery and 1 Serger,All Babylock. From the least costly to the top of the line Destiny and top of the line Triumph.They are all Workkhorses but EASY to use.Amazing machines all. Not as expensive as some the other machine but tops in all ways. I love your hoodie, it looks wonderful. Back in the late 70s I made a hoodie type jacket out of really nice non-stretch velvet. I loved the luxury of the fabric vs the casual style of the jacket. Apparently, my 18 year daughter loves it too because she’s been wearing it for a couple of years. It still looks great. Alas, the store where I bought the fabric is long gone but, believe it or not, my new favorite store sells all apparel fabric for 2.99 US. It’s local & you never know what they get shipped in, but the material is high quality & the people are great. I have been able to get some floral stretch velvet there. It’s not embroidered but it’s beautiful. I think I know what I want to do with it now. Thanks. Diane, in what part of the country do you live? I’m in south Louisiana and all but one chain fabric store has closed its doors. Plus they sell more crafting materials than apparel fabric. I resort to online but that can be iffy. If you are close enough I might take a road trip. Diane – WHERE IS YOUR STORE? You are so fortunate. Does the store have a website? Wow! It looks like the fabric was embroidered rather than having patches applied. I, too, like the flow of velvet on the hood. Thank you for your generosity with the free patterns! You’re most welcome, Leigh. Thanks for your feedback.